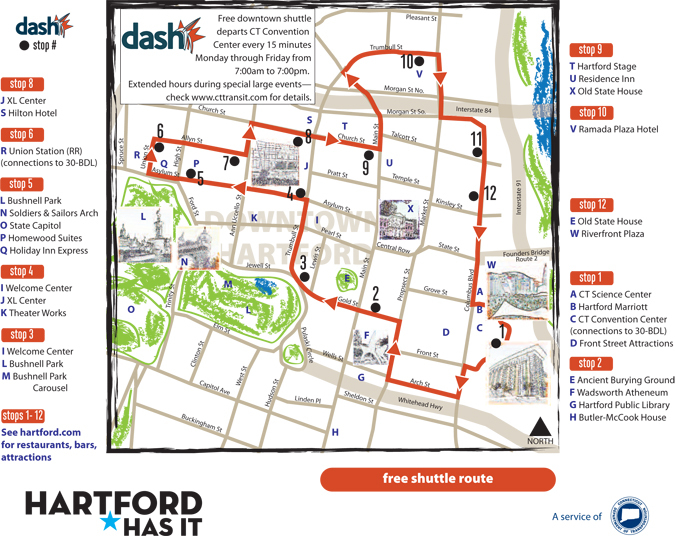 The dash Shuttle is a free downtown Hartford bus line that operates approximately every 15 minutes, Monday through Friday from 7:00am to 7:00pm. During major downtown events, enhancements may include later evening service on weekdays, as well as service on Saturdays and Sundays. The specific services planned for each major event will be posted on the CTTRANSIT website, as well as hartford.com and crdact.net. The dash Shuttle will not operate on weekends when there is no downtown event scheduled. The dash Shuttle stops at MAT (Main and Trumbull) Garage. The dash Shuttle route connects the CT Convention Center, the Riverfront, the CT Science Center, the Arts and Entertainment District, various restaurants, and downtown hotels.